Property 6: Keep calm and lake on at Hollan’s Hideaway on Big Barbee Lake! Property 10: Year Round Lake Front Cottage on Quiet Cove - Just Bring Your Boat! Property 13: Beautiful Cabin in the woods w/pond and 5.5 acres. Privacy within town. Property 19: Lake life the way it used to be. Sweet cabin on a private and serene lake. Property 20: Beautiful lake front property with all of the comforts of home! Property 23: Nothing fancy, just a whole lot of quiet and comfort. Property 24: Beautiful Lake Home in a quiet relaxing setting. Access to paddle boats. Property 34: Beautiful lakeside retreat with dock. 1 Hr to Notre Dame. Golf minutes away. Property 37: Two weeks left for Summer 2019 - Saturday, June 1 to Saturday, June 15. 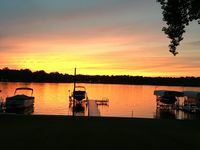 Property 38: Great Location With Lake Access On Beautiful Lake Wawasee! Spacious, functional, clean, with spectacular views! The house is in a great location on the lake, and what a beautiful home it is. Plenty of space with 4 bedrooms upstairs and a pullout couch downstairs (we slept 12 easily and comfortably), a living room upstairs and the spacial kitchen and dining area downstairs. The large deck was perfect for where we spent the majority of our time, loafing and laughing as a family who doesn&rsquo;t spend enough time together due to distance. Tippy Lake is big, clean and beautiful - perfect for fishing in the morning and tubing, skiing, cruising in the afternoon and evening. We enjoyed our stay and hope to be back in 2019. Thank you!! !